Minister of Housing and Infrastructure, Dr. Mohamed Muizzu has departed to China for talks on the China-Maldives Friendship Bridge under construction between Male’ City and Hulhule’. Speaking to press ahead of his departure to China, Muizzu said he is scheduled to meet with senior Chinese government officials during which they will discuss holding a colorful celebration to mark the opening of the bridge. 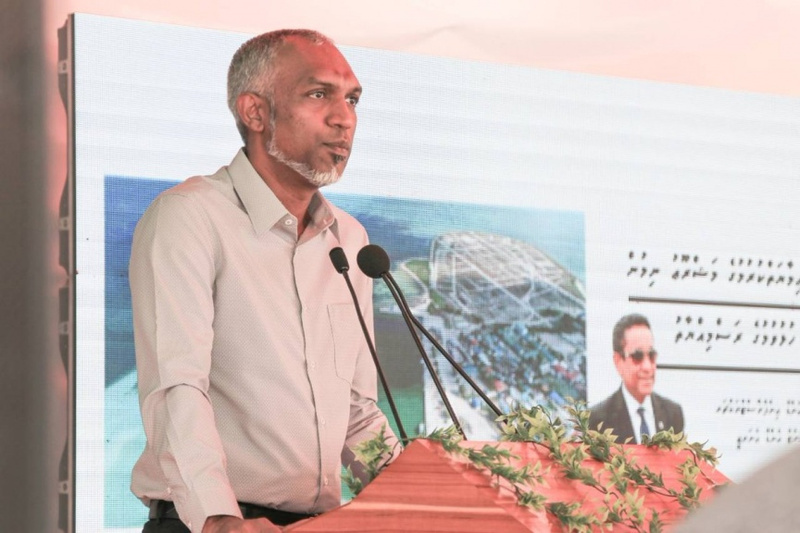 “Since this project also represents the relationship between the leaders of the two nations, we, and China believe we need to mark the completion of the project with colorful celebration,” said Muizzu. He said the function to mark the opening of the bridge will be co-organized by the two governments. Muizzu expressed confidence the project will be complete by August, as planned. The minister announced last week that all the piers of the Male’-side of the bridge have now been joined via concrete bridge deck. Workers are now installing steel box girders on the bridge. The minister said earlier that the work began in March, and will be complete by July. He said once the installation of steel box girders is complete, workers will begin using asphalt to level the bridge and install light fixtures on the bridge. Muizzu said in a recent press conference that the bridge will be made functional in time for the upcoming Maldivian Presidential Election. The China-Maldives Friendship Bridge Project is worth USD 300 million (MVR 4.7 billion). The Chinese government provided USD 100 million as non-reimbursable financial aid, and a USD 170 million low-interest loan at two percent for the project. The remaining USD 30 million was put in by the Maldivian government. The bridge is 1.39 kilometers long and 20 meters wide, and will have two lanes for four-wheeled vehicles, two lanes for motorcycles, one lane for bicycles and one lane for pedestrians. Meanwhile, work on constructing roads in Male’ City, Hulhule’ and Hulhumale’ connecting to the bridge is being carried out alongside the construction of the bridge. And Maldives Ports limited (MPL) is preparing to arrange bus transportation for passengers along the bridge.